As part of the Travel Penticton, Youth Influencers Program, KVR Middle School students were tasked with writing blogs focusing on four key traveler types: Adventurers, Athletes, Families and Foodies. Below is the first in a series that will be released over the next few weeks. We hope that you enjoy these insightful and candid reviews by our local youth and that they encourage you to visit our wonderfully diverse City. 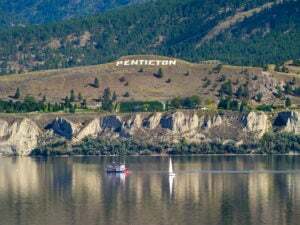 There are many amazing, adventurous places in Penticton, but here are our personal favourites. There is a place in between Skaha and Okanagan Lake called The Channel which runs from lake to lake. It’s great for a family visit and a long, slow floatie ride, relaxing in the sun. It’s very exciting when the semi trunks honk at you as you float by. Don’t forget to bring goggles to see the fish swim under your raft in the shade. If you’re not a fan of seaweed, it’s a good idea to stay on your raft because it feels like someone’s trying to drag you to the depths of the channel – make sure to bring life jackets for the children just in case. You need to use sunscreen because it’s hot and bright and sunglasses are also recommended. People enjoying a float down The Channel in Penticton, BC. There is also a place just off Vancouver Road called by locals, the Hobo Trail that is a cool place for biking, running and walking. The trail has been worked on to have a bike track and jumps, twists and turns drops for a more amusing time. There are also trails near the marina and Munson Mountain. But the most fun of all is that there is always a new place to find and explore. There are no real trail names, but this one trail leads to the lake and it is a beautiful and quiet cove. It is honestly an amazing experience. 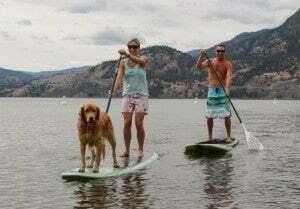 My idea of an adventure is going boating on Okanagan Lake with my family. We used to go out for hours and swim, laugh and eat chips and other beach foods. On the boat my family and I would always argue about who got to sit in the very front seat, because that person was always highest in the air when the boat was going fast and would lift up. We used to invite friends out with us and when it got dark we would go to shore and start a campfire. The parents would bring hot dogs and we would sit by the fire. Some of the people would go out on our paddle board and go out to the buoys. They would race to see who could get to the buoys fastest. All of the kids would sit on the dock and joke around until we were called in to leave. What is your idea of an adventure, because I am sure we have it here?